Known for her legendary beauty and her coquettish charm, Madhubala (real name Mumtaz Jehan Begum Dehlavi) was much more than that, reports The Hindustan Times. It is a known fact that every beautiful and successful actress who has ruled the Indian silver screen has been compared to Madhubala, at least once in her lifetime. So striking was her beauty that famous film journalist BK Karanjia had declared that ‘none of her published photographs did full justice to her quite extraordinary beauty’. Her co-stars would often talk of her admiringly. Dev Anand was once quoted as saying “statuesque is the word I would use for her”. Baburao Patel, editor and publisher of Filmfare, both feared and respected by the film industry, had dubbed her the ‘Venus of the Indian Screen’. If it wasn’t her beauty, then her love life (or maybe the lack of it) and her troubled marriage was what people remember her for. Madhubala and Dilip Kumar (Yusuf Khan) were madly in love. Both were superbly matched – successful stars with a huge fan following, Pathans and incredibly good looking. That they shared a faith too should have been a plus. However, it is alleged that her father, the formidable Ataullah Khan, was the reason behind the split. Madhubala’s father was initially opposed to the match but eventually came around. However, he agreed to the match on condition that Dilip works for his production house, an offer unacceptable to the actor. Dilip has been quoted as saying “her father’s attempt to make the proposed marriage a business venture” was what ruined it for him. Her marriage to Kishore Kumar (they remained married for nine years) was equally problematic. It has been alleged that she got married to him on a whim that she could get any man she desired. Whatever the reason, the union was an unhappy one and some say the principle reason was her declining health. 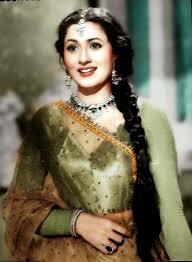 Madhubala suffered from an incurable health problem – she had a hole in her heart. The condition is called ventricular septal defect in medical terms, in which the body produces extra blood. It has been reported that she would often bleed from her nose and mouth. A doctor would routinely come to her home to extract blood from her body. By early 1960s, the condition went from bad to worse. Her health affected her mood and it is alleged that she and Kishore often fought and she mostly lived in her father’s home. Her end came in 1969, aged 36. While the story of her life, her beauty, her appeal and her legion of fans have added to her enduring legacy, for nearly 40 years after her death, she is best remembered for her role as the doomed courtesan Anarkali in the iconic Bollywood film, Mughal-e-Azam. However, limiting her legacy to the K Asif film alone would do a great disservice to the actor in her. For even in the short career of 27 years (she made her acting debut as a child artist in a film called Basant in 1942), Madhubala acted in a variety of roles. Songs picturised on her still feature in music shows on television.